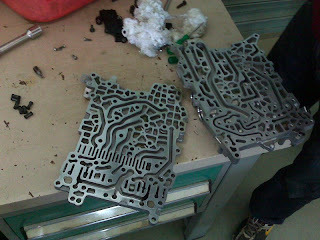 Randy from India posted up some pictures and information on a GR6 transmission error. Mostly what he found was small pieces of metal in the transmission that caused the solenoids to stick. Some really good information. Thanks for posting this up Randy. the car is now in limp mode and I soon realize that only 1-3-5-R gears are working and I cant go above 30 miles. After checking the fault code with the Access Port we found the error code - 0732. 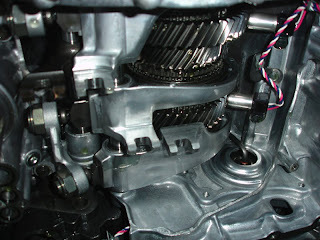 We then opened up the transmission valve body and found gear no -2 was jammed on Clutch A. Due to this the electronics kicked in going into fail safe mode and switching the transmission to Clutch B with 1-3-5-R only working. Other observations - The oil was very dirty and was black in color we also found some small pieces of metal and there was a type of black metal paste on the Actuators. Our first instinct was that this jamming of the gear has happened because of a solenoid failure. So we removed the actuator pistons and cleaned them properly before installing them back we also found some small metal particle on the inside cover of the solenoids which we cleaned. After the clean up process we installed the valve body back on the car then I used the Access port to clear the codes and then started up the car there with no codes and system check was OK. I take the car for a drive on Manual mode going through 1-2-3-4-5 .... At this stage we ruled out a broken gear as all were functioning perfect up and down. then try 6 nothing happens for a sec then the transmission light again comes back on going into failsafe mode with gears 1-3-5-R only working. We check the codes and we get-0729. Installing the valve body back into the transmission housing has to be done with the magnetic strip on the same side as the Gear Position Sensor - To do this you would need to use a hard copper wire and place it through the valve body holding the actuator piston ( If you look close at the actuator there is a hole in the center for this to be done) so we can insert this wire to hold the piston in place so that the magnetic strip is on the same side as the Gear Position Sensor. -- I am sure Nissan - or Borg Warner is using a tool like this to install the valve body into the transmission. 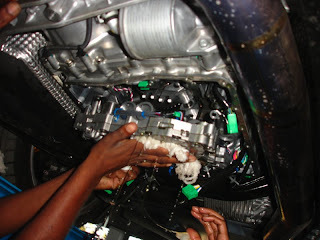 BOTTOM LINE IS - THE DIRT AND METAL PARTICLES IN THE TRANSMISSION FLUID HAD CAUSED A BLOCKAGE IN THE ACTUATORS AND THE PARTICLES IN THE SOLENOIDS WERE ALSO AFFECTING THE PRESSURE REQUIRED IN THE SYSTEM THEREBY CAUSING THE ACTUATORS FROM PERFORMING CORRECTLY. 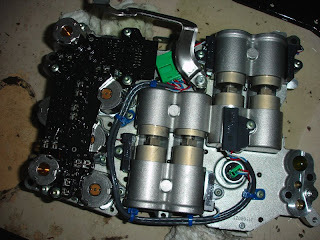 SECONDLY INSTALL THE VALVE BODY CORRECTLY!! hi, i have the same problem, can you help me ?